The Virtual Krewe of Vaporwave, with a big assist from the Arts Council of New Orleans, presents OEDIPUS MAX: A Vaporwave Rock Opera in the Piazza D’Italia on Friday, February 22nd. It’s a ball… it’s an opera… it’s a party… it’s all of the things. Every single one of the things is what this is and you are invited! 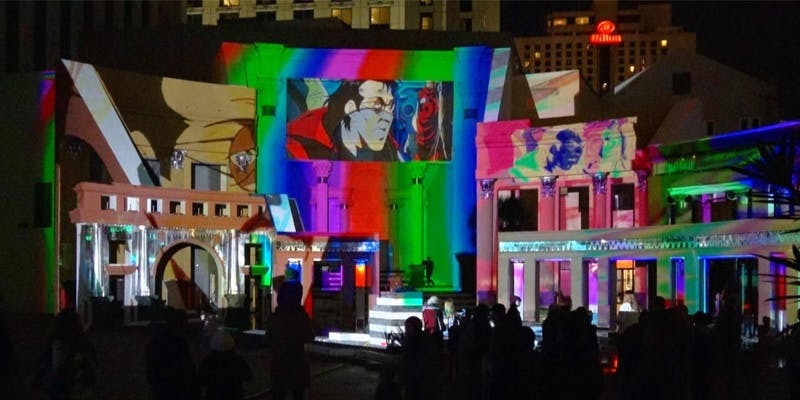 Join us and the pseudo-secret artists of Virtual Krewe of Vaporwave as we light up the Piazza D’Italia with our three-act, extremely loud, projection-mapped MASTERPIECE of a Vaporwave Rock Opera, OEDIPUS MAX. Multiple performance stages. Two cinema projectors. IDK how many other projectors… a lot. A LOT OF PROJECTORS. A 48-screen LED video trailer. Surround sound. A GIANT FACE. Something called a “Laser Libretto.” Conveniently placed trash receptacles. TOTAL IMMERSIVITY. …and improv troupe Special Features as EXTREMELY RICH PEOPLE who mock your pauper’s lifestyle. How, pray tell - HOW - will we pack so much entertainment into only 4 hours of party? The answer is: VERY EFFICIENTLY. Something That Looks Great and You Just Say It’s from an Opera Because TBH We Don’t Know All of the Operas and We’re Not Going to Sit There at the Door with a List of Operas. OR: dress in all white and BE the projection surface. Tickets are on sale now! $20 via Eventbrite. Walk-up cost is $30. Don’t get caught paying $30 LIKE SOME SORT OF RUBE.